Annette Strachan finished school at 16 having completed year 11. The age to become a female police officer was 20 back then and at 20 she was thinking about marriage and a family. Her dreams of becoming a police officer were lost until her third child was choosing his VCE subjects and her husband encouraged her to pursue her dreams. Annette had work as a medical receptionist for 13 years and also the Commonwealth Bank for 10 years. After 5 months in the academy, she first started work at Heidelberg station. The station had cells attached and she wasn’t really keen to work there however she learnt the very valuable lesson that many people don’t learn for years which was that if you treat people with respect all of the time you will get treated with respect back. She was persistent with her work and never gave up; she would keep trying and trying until she perfected it. 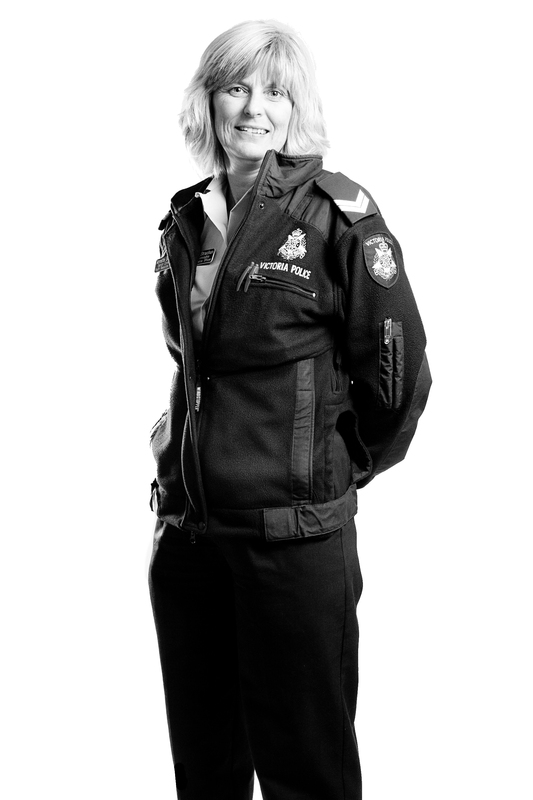 She is now a police officer based at Greensborough, she has the role of youth resource officer, and she is passionate about her role and is respected for it. Annette finds it easier to communicate with the youth of today and finds it more difficult to communicate with adults. She thinks strongly that everybody should get a fair chance and that people should get rewarded for the things they do right not only get noticed for what they do wrong. Her aim is to try and keep the youth out of the court system and to give and support as much as she possible can. She loves rewarding good behaviour and likes seeing justice done. Her aim is to help young people become responsible adults. Annette’s husband has always encouraged Annette to follow her dreams and she will support her children with whatever their dreams may be. She attends schools and gives presentations about various topics including how she helps people in our community and how she likes to see justice win. Annette is also involved in programs that help teenagers get a second chance so that they can learn from their mistakes and not just get punished for what they do wrong. She said that it’s not always the young person’s fault sometimes it’s more complicated than that such as family/friends problems and all they need is a bit of help and support but she believes that we all have choices. Some of the programs that Annette helps are the L2P program which helps youth get there 120 hours of driving hours up and is free of charge. The ropes program is another and is when a police officer thinks the person could benefit from a second chance as they are sorry and have made a mistake but have learnt from it. At the end of the day it is up to the Magistrate to make the decision of the consequence. Other program she’s involved in is the Kan du program, which is a human values program to address anti-social behaviour in 8-10 year olds. She also sits on a number of committees including the Malahang bike hut. She is currently working on an assault preventative program which she calls the P.A.I.N. program which is preventing assault injuries now for year 9 students as she has feels that assaults is one thing that can get young people in trouble. She said “life is like an upside down traffic light” for some young people of our generation. They often see the green light and go then they see the yellow and finally the red and stop and sometimes it is too late and they compromised their safety and the safety of others. She has been a youth resource officer for five years now and loves her work. Annette is a very loving and caring person that is always happy to help others.